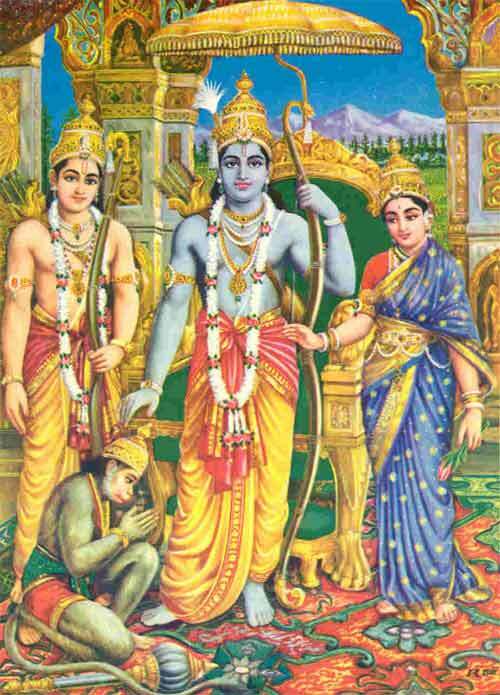 Rama Raksha Stotram is a prayer dedicated to Sri Rama. The popular belief is that the chanting of the Ramraksha Stotra will help in removing troubles in one’s life, especially those associated with horoscope and astrology. It is also chanted for getting mental strength. Here is a pdf format of the Rama Raksha Stotram with lyrics and English meaning. You can download it for free. The meaning of the Stotra is by S V Ganesan. Thus begins the dhyaana mantra – one should meditate Rama who has arms reaching his knees, who is holding a bow and arrow, who is seated in a lotus position, who is wearing yellow clothes, whose eyes compete with petals of a fresh lotus, who looks satisfied, whose eyes are fixed on the lotus-like (pretty) face of Sita sitting in his left lap, whose color is like that of rain cloud, who has adorned different jewelry, who is wearing hair reaching upto his thighs.